Yesterday saw numerous releases with an average euro increase of 15% translating as an average sterling increase of 27%, which lent purpose to us troubling your inbox. Taken with this morning’s releases the last two days average out at a 17% euro increase. This means that only very high scoring wines, that exceed their 2015 scores will be appealing, where their Price Over Points average distributes attractively. This morning Chateau Clinet, Leoville Poyferre, Pichon Baron and Ducru Beaucaillou have released. They fit within this model and Poyferre and especially Clinet are appealing, Ducru Beaucaillou however has witnessed several years of aggressive increases leaving no investment incentive to buy on release. The leading Second Growth, Leoville Poyferre has released today at £800 per case of 12, a 20% euro increase. In 2016, like most wine from St.Julien, Leoville Poyferre has produced a magnificent vintage, which has been awarded 95-97 points from Neal Martin. Martin describes it as ‘perhaps one of the most harmonious Poyferré that I have encountered at this juncture. It just glides across the mouth and slips down the throat with consummate ease. Superb.’ The price and score stacks up well against the 93 point scoring 2005 which trades at £850. With a median score of 96 points and the potential of 97 points, today’s release of £800 per case offers a 29% discount to the 98+ point scoring 2010. When comparing past release scores and market prices, the 2016 vintages median score would indicate a market price of around £1,040 (point B on the graph below). Today’s release price of £800 (point A) therefore shows an attractive discount. With an under-priced release, such as this, price appreciation can be expected in the near term with an upward shift from point A to B. 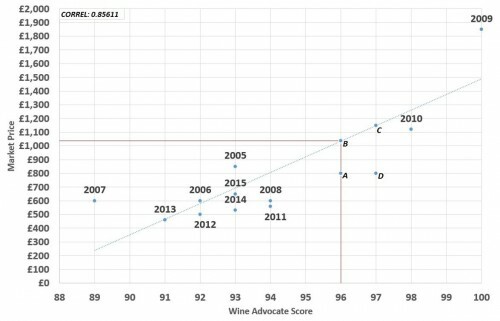 A more dramatic price adjustment can be anticipated upon rescore, should the 2016 vintage achieve the upper end of its banded score. Today’s price will then move horizontally along the x axis from point A to D, whilst the expected market value will move upwards along the trendline from B to C. This will increase the expected return from the distance between A and B, to the distance between D and C. This equates to an expected return of £350.